The 1967 FA Charity Shield was the 45th FA Charity Shield, an annual football match held between the winners of the previous season's Football League and FA Cup competitions. The match was contested by Manchester United, who had won the 1966–67 Football League, and Tottenham Hotspur, who had won the 1966–67 FA Cup, at Old Trafford, Manchester, on 12 August 1967. The match was drawn 3–3, which meant that the two clubs shared the Shield, holding it for six months each. 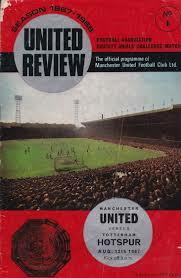 Bobby Charlton scored two goals for United, while Denis Law scored their third. Jimmy Robertson and Frank Saul scored for Spurs, but the match is most famous for Tottenham's second goal, which was scored by goalkeeper Pat Jennings. Ball in hand, Jennings punted it downfield, only for it to bounce in front of United goalkeeper Alex Stepney, over his head and into the goal. ^ "The Shield – A brief history". The FA Cup & Competitions. TheFA.com. Retrieved 7 February 2011. The 1967–68 season was one of the most successful seasons in Manchester United's history, as the team beat Benfica 4–1 in the final of the 1967–68 European Cup to become the first English team to win the competition. The team was led by manager Matt Busby. Despite the European Cup success, United finished second in the First Division, two points behind local rival Manchester City after losing the last game of the season against Sunderland. The 1967–68 season was a breakout year for winger George Best, who led the team with 28 goals in the First Division and 32 goals overall, being voted European Footballer of the Year and FWA Footballer of the Year. Four other players scored double-digit goals during the campaign: Bobby Charlton (20), Brian Kidd (17), Denis Law (11), and young winger John Aston, Jr. (10). Alexander Cyril Stepney (born 18 September 1942) is an English former football player who was Manchester United's goalkeeper when they became the first English club to win the European Cup. Cyril Barry Knowles (13 July 1944 – 30 August 1991) was a footballer who played full-back for Tottenham Hotspur and England. He was the son of the rugby league footballer; Cyril Knowles, and the older brother of fellow professional footballer Peter Knowles. He died of cancer on 30 August 1991 aged 47. Goals scored by goalkeepers are a somewhat rare event in football. Goalkeepers spend the majority of a match in the penalty area of their own team, a marked area around the goal they are defending in which they can handle the ball, in order to defend their goal. It is highly unusual for a goalkeeper to move far beyond this area and join an attack, as this leaves the defence vulnerable to long-distance attempts until the goalkeeper can return to defend it. The most prolific goalscoring goalkeepers are those who take penalties or free kicks. Other occasions where goalkeepers sometimes score include set pieces where a goalkeeper joins an attack as a team is chasing a goal in order to prevent a defeat, or from goal kicks or otherwise regular clearances which travel the length of the pitch into the opposite goal. Patrick Anthony Jennings (born 12 June 1945) is a Northern Irish former footballer. He played 119 games for Northern Ireland as a goalkeeper, a figure which at the time was a world record and is still a Northern Ireland record, in an international career which lasted for over 22 years. During his career Jennings played for Newry Town, Watford, and in the top division with Tottenham Hotspur and Arsenal, winning the FA Cup with both of the north London rivals. In total, Jennings made over 1,000 top level appearances, and despite being a goalkeeper he scored in the 1967 FA Charity Shield.